As the holidays approach, we are deeply grateful for your support throughout 2017. What a productive, inspiring year this has been. We are glad the holidays have arrived – merriment, celebration and feasting are in order! “Paul of Tarsus, too, was sore afraid. He feared that other Caesars, other prophets, might one day persuade men that man was nothing save a servant unto them, that men might yield up their birthright from God for pottage and walk no more in freedom. For our 2017 Christmas donations we are pleased to honor several special individuals for their fearless defense of our freedoms. Jesselyn Radack heads the Whistleblower and Source Protection Program (WHISPeR) at ExposeFacts. The Whistleblower and Source Protection Program (WHISPeR) at ExposeFacts provides critical legal support for whistleblowers and media sources in the national security and human rights arena. We know of Jesselyn as attorney for NSA whistleblowers Bill Binney, Tom Drake and J. Kirk Wiebe and their Congressional colleague Diane Roark, senior staff to the House Intelligence Committee tasked with oversight of the NSA. The malicious prosecution of the NSA whistleblowers is described in Frederich Moser’s documentary A Good American. Christmas is a also a story of mother and child. So it is fitting that our second honoree should be a mother standing to protect her child from prosecutorial misconduct. Lyn Ulbricht leads the Ross Ulbricht Legal Defense effort to free her son from a double life sentence for minor non-violent-charges. You can learn more by visiting FreeRoss.org. The malicious prosecution of Ross Ulbricht is described in the documentary Deep Web and numerous excellent speeches by Lyn describing the case at FreeRoss.org. It is difficult to describe the terror that comes with being targeted by prosecutors and courts that are free to ignore or compromise civil and criminal procedures and the law itself. Those who chose to defend against this lawlessness are some of the most courageous men and women among us – fighting to affirm the laws that protect everyone. They stand on the wall between freedom and tyranny. They stand for all of us. Jessleyn Radack and her colleagues at WHISPeR – Donate Here. Lyn and Ross Ulbricht at FreeRoss.org – Donate Here. On behalf of the entire team at the Solari Report, Merry Christmas and Happy New Year! 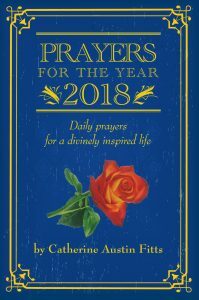 2018 Prayer Book Coming Soon!